Get instant light with the push of a button! Grab It. Move It. Load It. Makes a great gift for any truck owner! The Industry’s Best Warranty - The RetraxOne features a limited lifetime warranty, meaning you’ll never have to worry about your bed cover once you have it installed. Sealed-For-Life Bearings Mean Smooth, One-Handed Operation - Sealed ball-bearing rollers are mounted onto each section. This allows the retractable cover to open and close easily with one hand, without the need for pull straps, Velcro, snaps or springs. Ball-bearings provide smooth operation, preventing the cover from binding when opening or closing. Patented System Stays Flush Open Or Closed - Our patented low-profile design is always flush, enhancing the integrity of your truck’s style rather than overcoming it. Your cover will seal tight and look good. Unlike soft covers that bulk up when rolled, the flush front cover streamlines the overall appearance and provides a firm, dependable seal that keeps out the elements and helps keep the bed dry. Locks In Any Position - The RetraxOne cover can be latched or key locked in any position. This allows for unlimited flexibility in hauling almost any object, and the secure Dual Latch Locking System provides protection unlike any other cover. Rugged Aluminum Construction - RetraxPRO bed covers have the same great benefits as the RetraxONE but are made with industrial strength aluminum, giving them the strength to support distributed loads of more than 500 pounds! The Industry’s Best Warranty - The RetraxPRO features a limited lifetime warranty, meaning you’ll never have to worry about your bed cover once you have it installed. Locks In Any Position - The RetraxPRO cover can be latched or key locked in any position. This allows for unlimited flexibility in hauling almost any object, and the secure Dual Latch Locking System provides protection unlike any other cover. Using a wireless key fob this retractable truck bed cover opens and closes easily with the touch of a button. The PowertraxONE also features an integrated LED cargo light on the canister that is operated by the key fob and includes a safety auto shutoff feature. An electromagnetic brake allows the cover to lock in any position along the rail allowing you to have unlimited hauling capacity. 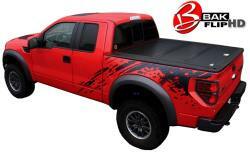 The PowertraxONE truck bed cover offers you ultimate cargo protection with the luxury of hands free operation. The PowertraxPRO also features an integrated LED cargo light on the canister that is operated by the key fob and includes a safety auto shutoff feature. 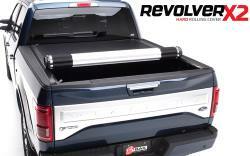 The PowertraxPRO truck bed cover offers you ultimate cargo protection with the luxury of hands free operation. 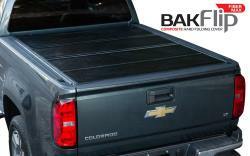 These Tonneau Covers are compatible with most truck bed accessories such as bed rails, box caps, spray on and under the rail bedliners, and tailgate protectors. 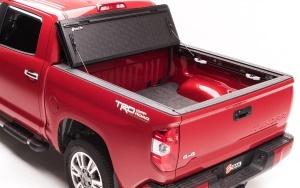 Just Like The Truxedo Roll-Up Cover But Dual Front Latching System Quick-release on the 30-inch wide front panel makes bed entry convenient from both driver and passenger sides of truck at FRONT of the bed. 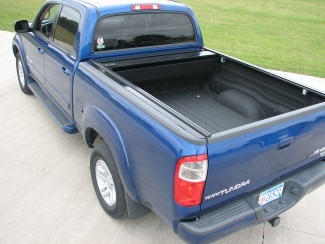 This Tonneau Cover is compatible with most truck bed accessories such as bed rails, box caps, spray on and under the rail bedliners, and tailgate protectors. Durable and Solid - Strong, lightweight aluminum slats provide a 400 pound load rating. and UV-resistant, leather-grain vinyl offers protection from the elements. Style - Sophisticated style and a sleek, low-profile design make the Titanium a perfect complement to any truck. 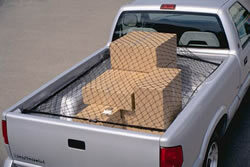 Ultimate Security - Simply close your cover and lock your tailgate to secure your cargo. Easy Operation - Open cover from either side, and simply roll the cover back towards the cab to open. No lifting required. Integrated Slat Caps - Slat caps offer a cool-to-the-touch operating point when cover is hot, and provide a finished professional look. 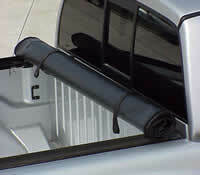 Extang engineered tri-fold style tonneau cover. Fast, easy, no assembly required. No tools. The Solid Fold provides easy and convenient use, great style and cargo security! 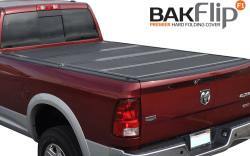 Our low profile, hard panel tri-fold offers easy access from both the front and rear of your truck bed. The EnCore cover is self-positioning for pain free installation and self-latching for extra security. Engineered rear latches lock the cover at the tailgate, and supplemental tethers secure your cover to the side rails. Wide opening front panel provides access to front half of bed and can be locked using your ignition key featuring BOLT®, one-key lock technology (most models). Extang's exclusively designed panels feature industry exclusive TPO (Thermoplastic Olefin) skins paired with a polypropylene core for a superior alternative to the traditional aluminum panel. These panels have been rigorously tested to meet and exceed the strictest of OEM testing. EnCore is engineered ExtangTuff to resist dents and scratches, and features the only 1-inch aluminum frame with a powder coated finish and rubber corners. EnCore's ALL NEW flexible hinge system is ultra-strong, water resistant and provides superior performance. Encore’s TPO skins and matte finish is cooler to the touch and will not fade in the hot sun.